Head to the resort town of Ao Nang for a holiday by the sea and an exploration of an area where many dive instruction centers offer training necessary to access some of the region's best dive spots. A popular place for rock climbing, Ao Nang draws tourists interested in scaling limestone cliff faces that bracket the white sandy coastline. The town features many bars with a relaxing atmosphere, as well as some establishments known for playing music until the wee hours. 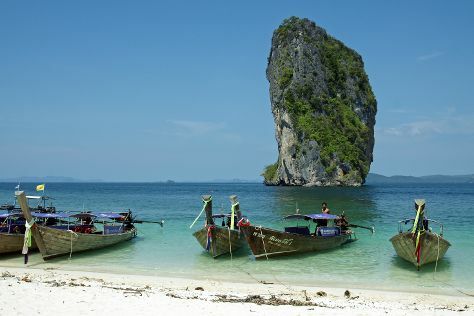 The beach provides a jumping off point for many boat tours, boosting Ao Nang tourism and making the town a convenient place to stay when exploring the region. Ao Nang is in Krabi Town. Use our online itinerary creator: Ao Nang and all its delights await.